1. 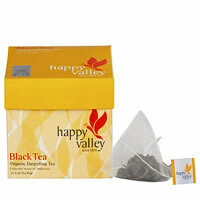 Organic Darjeeling Black tea - A mature, well rounded tea with a distinct bouquet flavor. The finest leaf is handpicked by experienced workers and carefully crafted to enhance the legendary flavor of Darjeeling tea. 2. Organic Darjeeling Green Tea - An elegant tea with the freshness of nature in a light, bright cup with a smooth sweet flavor. Green tea is rich in antioxidants that have well known health benefits. 3. Organic Darjeeling Earl Grey tea - The well rounded Darjeeling Black tea with tangy orange peels and natural Bergamot flavor offers an enlivening cup with a distinct citrus flavor. 4. 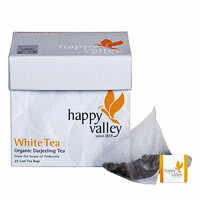 Organic Darjeeling Rose Tea - Organic Black tea grown at Happy Valley Tea Estate is combined with delicate rose petals to create a fragrant tea that lingers on the palate and in memory. 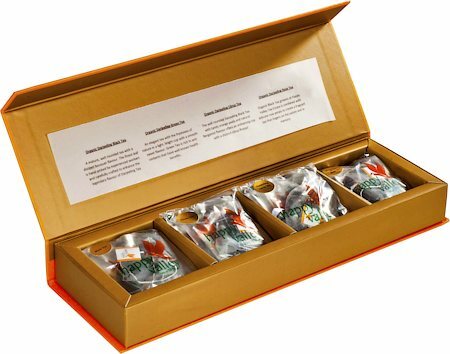 Pyramid Tea bags are creatively designed to carry pre measured whole leaf teas. The leaves are allowed to fully unfurl and reveal the pure quality and the inherent flavor of the tea.